Mahogany Conference Tables Provide A Solid Work Surface That Looks Great For Any Conference Environment. 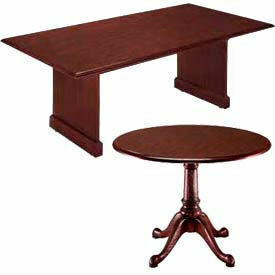 Mahogany finished collection features cascade beveled tabletop edging for luxurious detailing. Conference Room Tables feature durable high pressure laminate with solid wood molding and bases. Round Conference Tables feature solid wood edging and 4-blade base. Rectangular Conference Tables include wood veneer edges and twin slab end bases with apron support rails. End bases are mitered for added stability and provide an attractive finished appearance. 30 H. Easy Assembly. 10 Year Limited Warranty.